This week's inspiration is probably one of the most flexible, and versatile components that can be added to a home. It's contribution to the overall aesthetics of a space are often sorely underrated. Today We're talking about glass. 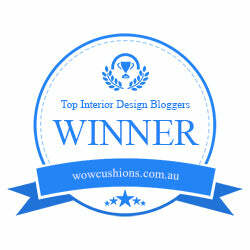 More specifically, glassware, and how you can use it in decorating your home. For small space dwellers - especially those with limited budgets and wall decor restrictions - this element is key. Like mirrors (see my post on mirrors here), light bounces off of glass beautifully. Unlike a mirror, light passes through glass causing it to illuminate surfaces. Glass is visually light, giving areas a spacious and airy feel. 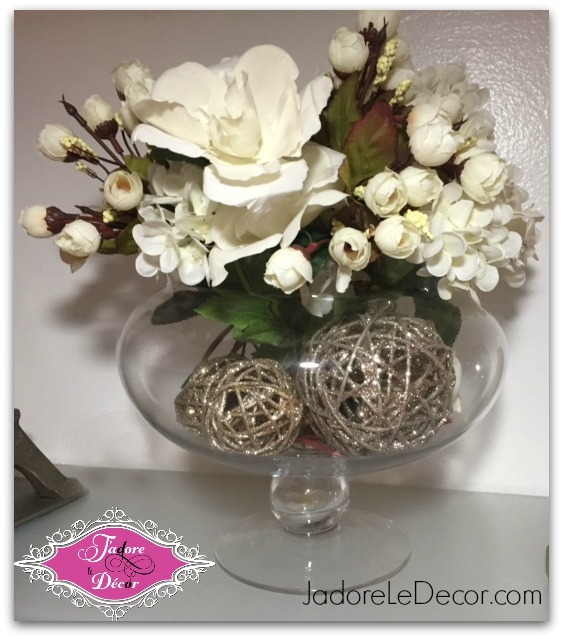 It adds a touch of sophistication wherever it is placed. It is tough, yet delicate. And while it can give off an expensive look, it can also be ridiculously cheap in price. It can be found at any thrift store. I've even found some good, weighty pieces at my local Dollar Tree. It's not often that I recommend dollar stores, but in terms of glassware, they are definitely worth investigating. Glass items can be purchased at either of these locations for anywhere from .49 cents for smaller items, to $5 or $10 for larger serving pieces. The photo below shows how simple wine decanters can be used as an everyday centerpiece for the table. Notice also how the light bounces off of them, making the room glow. When you're ready to use the items for their intended purpose, simply clean them and change out the contents. This helps to fight against collecting clutter, and ensures that every item you bring into your home is put to good use. The floor to ceiling bookcase below illustrates beautifully how glass can be used in place of traditional wall art. 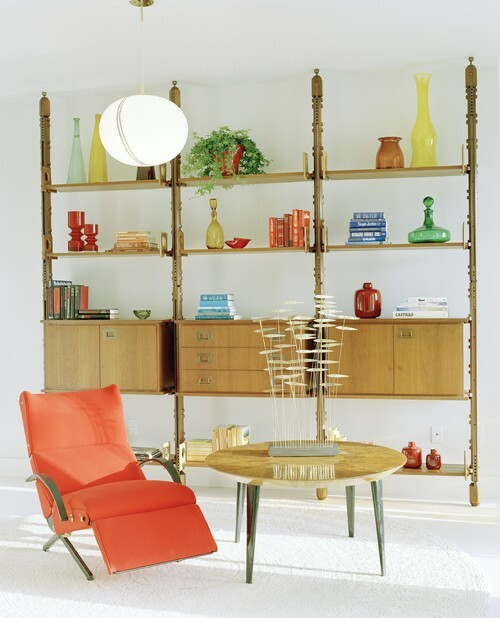 Here, colored glass vases are featured in this mid-century modern room. When you live in a space that restricts you from hanging any type of wall decor, displaying glassware on bookshelves and sideboards is a great alternative. By now you should start to see how functional glassware can be. 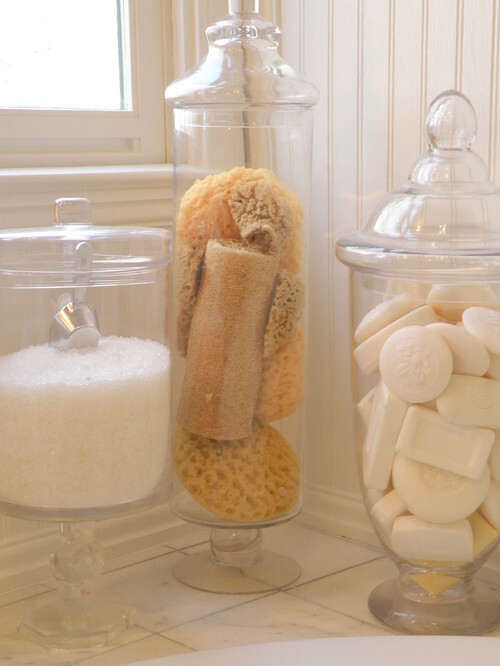 From fruit, to bar soap, to laundry detergent, to cotton balls, to loofah sponges - when used for storage - glass vases and apothecary jars can turn everyday items into mini sculptures. Wondering where to put all that glassware from the candy bar at your last party? 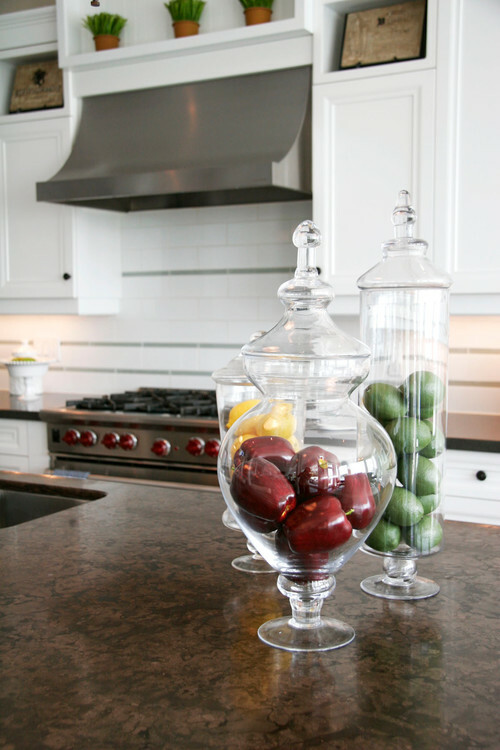 Notice in the photos below how using glass elevates the look of items you use everyday. I even use apothecary jars and left over candy dishes from parties I've styled in my own home. Tell me please, how do you incorporate different types of glass in your home?